September 21, 2017, 11:22 AM · Another violinist found himself stuck at an airport, given the option of either handing over his valuable instrument to be packed away in cargo or missing his flight and missing an important gig. Alex "Sasha" Petrin was scheduled to fly from San Jose, Calif. to Dallas, then on to New York City, on Tuesday via American Airlines. When boarding in San Jose, "I moved forward and the flight attendant scanned my ticket. Both she and another employee noticed my violin case and told me I can’t board on the plane unless I pay $50 and check it in, that being the only option," Petrin wrote on his Facebook page after the incident "When I heard this, I knew I couldn’t do that since I own an expensive instrument." Petrin plays a 2008 Boris Sverdlik violin valued around $30,000, he told Violinist.com. Petrin was on his way to New York, where he was going to travel to Philadelphia to play in the Camden, N.J. -based orchestra Symphony in C, where he has been a member for four years. Sasha Petrin, awaiting his AA plane Tuesday. When this conflict came up during boarding, "they told me I was slowing them and the rest of the passengers down and that they wouldn’t make any exemption," Petrin said. "When I asked about the fate of my luggage...they told me to go back to baggage check. There they told me that my luggage would fly to NYC without me. Needless to say that I stayed in the airport because I didn’t want to risk the safety of my instrument." After speaking to someone in baggage claim, Petrin returned to the American Airlines counter to speak with a supervisor. "He gave me couple of options but didn't seem to care about my situation much. The options were limited and I would have to buy a new ticket without getting a refund," Petrin said. "In the next two hours I was on the phone with both American Airlines and Travelocity, with the first telling me to contact the second and the second telling me to contact the first....Finally, at some point an employee from Travelocity gave me the option of using partial credit of $100 for future flights, which I find unacceptable considering the humiliation I went through not only at the airport, but in my professional life as well, by being denied to travel with my instrument on board." Petrin wound up returning via Amtrak train to San Francisco, where he is based. "In order to be part of Symphony in C’s second concert of the season, I had to cancel all my engagements in San Francisco between Tuesday and Saturday," Petrin said. 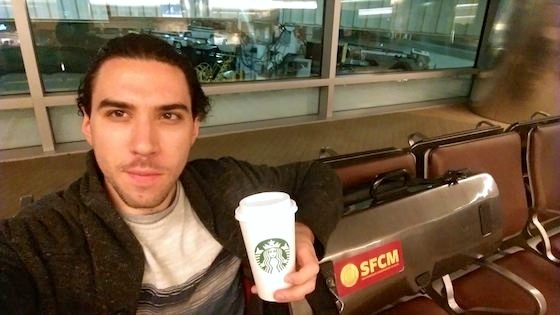 "This very negative experience at the San Jose airport affected not only my trip but most importantly my professional connection with the ensemble. Missing the first rehearsal in the musical world means losing the gig. A musician’s instrument is his most important belonging." The law is actually on Petrin's side: The FAA Air Transportation Modernization and Safety Improvement Act of 2012, approved by the U.S. Congress in February of that year, in Section 713, "requires an air carrier to permit an air passenger to carry a violin, guitar, or other musical instrument on a passenger aircraft without charge if it can be stowed safely in a suitable baggage compartment in the aircraft or under a passenger seat." "Unfortunately I didn't have the copy of the law on me; I was caught off guard," Petrin told Violinist.com in an e-mail. If you are traveling with your instrument, we recommend that you copy this bill, highlight Section 713, and put it in the pocket of your fiddle case. Here it is for you to copy. Bring your violin as your only carry-on bag to go in the overhead compartment. In fact, it's easiest to simply keep a copy of this in your case at all times. Whether this would have helped in Petrin's situation, it's hard to say. In several recent incidents, gate officials particularly at American Airlines have shown a disregard for musicians and their instruments and lack of knowledge about their own rules and regulations in regard to musical instruments. After Petrin posted the complaint on Facebook, American Airlines responded by saying, "We understand how this can be frustrating and disappointing. Your instrument is very important and we're sorry that you had issues. We'd like to review this further." They asked him to contact their Customer Relations team. September 21, 2017 at 07:45 PM · In the land where carrying guns is legal. I don't understand thus at all. What was the FARE CLASS and TYPE OF TICKET Mr. Petrin booked? If he booked his ticket through an OTA (like Travelocity), there is a good chance his ticket did not come with a carry-on bag included. It must be purchased extra. American Airlines is moving towards a-la carte, basic economy model of ticketing. Without knowing these details -- while Mt. Petrin's experience is admittedly poor -- there is nothing about the FAA reg which explicitly requires an airline to accept a carry-on if a carry-on was not included in the cost of the ticket. Finally, best practice is for musicians to arrive at the gate early -- ***at least 45-50min*** -- and identify themselves to the gate agent with their instrument at that time. If you wait until it is time to begin boarding, it is too late. If you wait until even 35min prior to take off, it is too late. You must be at the gate before the gate agents waiting on them and be first in line. To do otherwise limits the gate agent's ability to deal with this sort of situation calmly. If a musician waits until the time of boarding to get positive confirmation they are "okay to board", I hate to say it, but it shows a misunderstanding of the reality of traveling with instruments. Remember, airline employees are safety officers first, and hospitality officers second. Right or wrong, the airline employees will always error on the side of what they perceive to be safety. You need to give yourself enough time at the gate to educate them if they are ignorant to dealing with instruments. Thank goodness his instrument was always in his possession and unharmed. September 21, 2017 at 09:29 PM · "American Airlines responded by saying, 'We understand how this can be frustrating and disappointing. Your instrument is very important and we're sorry that you had issues. We'd like to review this further.' They asked him to contact their Customer Relations team." Why don't THEY contact their Customer Relations team? September 21, 2017 at 09:54 PM · American Airlines allows everyone a free carry-on, if it meets certain size specifications. The FAA law states that despite being a different size, musical instruments must be accommodated. The issue was not money, it was that they told him his instrument was the wrong size, and that he must check it as baggage, not to be allowed on board but to be put below in cargo. September 21, 2017 at 10:33 PM · I agree with everyone above. The one thing I don't get though is how the group he was going to play with couldn't have understood these kind of extenuating circumstances, especially since it looks like this wasn't his first time playing with them, and allowed him to come to all subsequent rehearsals, and play the concerts. I have heard of other professional groups, and even played in some, where, with the right reasons, this would be allowed. September 21, 2017 at 11:00 PM · Similar situation happened to me when traveling in high school to play on FtT. Then, a few years after that, my friends had similar problems and seeing that it was a law at that point, I noticed some musicians carrying a print-out of the document. I felt it may be even more convenient to have an sticker on our case with the law, so attendants could understand that the airline policy they often reference as a restriction, does not apply. By law it is our right to bring the instrument onboard and keep it safe. So far have not had a problem nor my friends when we first started making the stickers in 2014. If anyone is interested in purchasing one you can message me at kbpricemusic@aol.com. Best of luck out there! September 22, 2017 at 01:29 AM · This is a travesty. I've seen guitars brought on airplanes without problems. I've seen mandolins brought on without issue. My teacher carries a case with a violin and a viola together and has always been able to get them in the cabin. I've brought a violin on airplanes and the flight attendants have gone out of there way to insure it was stored safely and securely. Mr. Petrin was dealing with idiots. Some things worth noting: As pointed out in Laurie's comment, carrying on musical instruments is subject to certain restrictions, including size requirements. Also, please note the Rule does not guarantee a spot for the instrument, only that airlines not require removal of an instrument once stored. Please see Section 251.3 of the link I provided above. (Last page, middle column, bottom of page - particularly "b") Finally, please note that this applies to US-based carriers. I've given some thought to how we might ensure a spot in the overhead for instruments, and think perhaps one's best bet is to contact the airline and inquire if purchasing early boarding is an option (then make darn sure you are in the boarding area in plenty of time). If you can't purchase pre-boarding, then I would be inclined to use my $$ to purchase someone else's service. I know the previous perhaps seems unfair and illogical, but I also get that we are connected to our musical instruments, regardless of price. Thoughts? September 22, 2017 at 05:05 AM · Petrin told me that the orchestra manager was very understanding about the situation, but Petrin said he felt it would be "unfair and disrespectful towards my colleagues who contribute in all three rehearsals, to show up in the second rehearsal." Can you, or Mr. Petrin, comment on the fare class ticketed? Until our conversations about difficulties during travel are discussed on the same level of detail as the airlines, problems will persist. The American Airlines basic economy seats only include an item which fits under the seat. Basic economy tickets do not have access to the overhead bins. And a carry-on bag can not be purchased either. Only a personal item which fits under the seat is permitted. The AA basic economy product was rolled out nationwide earlier this month, and many travelers are unaware of the restrictions. This may not have been applicable to Mr. Petrin's case, however it is an important point for anyone trying look to your article as a guide. I imagine these basic economy tickets will be an increasing point of confusion between traveling musicians and airline baggage policies. Despite the FAA regulation, if a passenger is not entitled to *any* carry-on bag in the overhead bins, I can not see how they would be allowed to bring their violin aboard? As sympathetic as I am to Mr. Petrin's experience, while he did not do anything "wrong", he clearly did not do everything "right". You can never fly with an instrument and wait until the boarding process to identify and resolve any issues. This point must be addressed in every article about flying with instruments if we are to establish best travel practices. Having a copy of the FAA regulations is part of it...but when presented incorrectly, those FAA regulations create an adversarial environment. Musicians are not actually entitled to fly with instruments *unless* they work within the airline's process for determining if the instrument may be stored safely. The final determination is made by the airline, not the passenger. And when a musician does not identify themselves as having that instrument until the very last minute, yes, there is a valid argument that delaying the boarding process alone can be a safety issue. Musicians must show up early and ask: "I am traveling with a valuable and fragile instrument. What do I need to do to ensure I do not interrupt the boarding process, my instrument travels in the flight cabin, and we all have a safe, on-time departure?" September 22, 2017 at 08:26 PM · Also, I can only imagine how he must have felt having dropped all of that airfare only to not play the concert he was intending, and lose the income that would have resulted from it. I just don't see how it is disrespectful to show up late for something which was completely out of your control. By this logic, it's disrespectful to be stricken with any other misfortune and then show up somewhere and tough the rest of your commitment out, stroke, death of a relative, plane crash, etc. I think the classical world ought to learn a lesson from the rest of the music world lighten up a bit. September 22, 2017 at 10:20 PM · I flew a lot this summer, and it has been my experience that sometimes when you are at the gate you are told that you must check in your carryon because the overhead space is limited. This mapped to mr twice out of 8 flights, using the same carry on bag. Q: What is the carry-on policy for musical instruments on a Basic Economy ticket? A: In the case of customers who purchased a Basic Economy ticket, a small musical instrument may be carried on in addition to a small personal item as long as the instrument can be stowed in the overhead bin or under the seat in front of the customer at the time of boarding. A larger musical instrument that does not fit in the overhead bin due to its size and is brought to the gate will be checked to your final destination and subject to the applicable checked baggage fees plus a $25 gate handling charge (payment by credit card only). Finally, as 71.9.169.177 points out, printing and presenting copies of any regulation or rule in an effort to convince an airline employee to "allow" carry-on of a musical instrument requires both perfect timing and extreme diplomacy. September 24, 2017 at 03:25 PM · A couple of years ago I flew tourist economy with Emirates from Glasgow to Hong Kong and back, with a violin as carry-on. No one batted an eyelid and cabin crew helped me to find a suitable locker close to my seat. Maybe other carriers could follow this example? September 25, 2017 at 12:05 PM · I too suspect it's the Basic Economy fare that caused this. Karl Peterson covered the issues pretty thoroughly. These new bare bones fares—frequently the default fare sold on sites like Expedia—often catch passengers by surprise because they didn't realize the restrictions when they bought the ticket. But those rules are zealously enforced during boarding. Even if a passenger on a Basic Economy fare technically has the right to stow a musical instrument in the overhead bin, and even if the gate agent knows about the musical instrument exception to the no-carry-on rule, he will usually be among the last to board, when the bins are already full. Basic Economy is just a no-win "innovation" all around.